We’re all feeling the pain of high petrol and diesel costs at the moment with prices at the pump hitting more than 150p per litre in some places. I know that some investors like to hedge their bets and own shares in companies that do well at the expense of the rest of us, so today I’ll be putting Royal Dutch Shell through my investment checklist to see how it stacks up. My first consideration is always safety. I don’t want to be taking on big risks and I don’t want to be kept up at night like Game Group investors, wondering if the company will go bust at any moment. Diverse portfolio – One of the keys to staying safe is to stay diversified. I already hold BP shares in my portfolio, so I would need to think about whether I wanted to own another energy and petrochemical company. Generally I would say yes but that would be it. I wouldn’t want to own more than two very similar companies because they are often susceptible to the same risks; an example in this case would be falling oil prices. Geographic diversity – This is also important, as it can help reduce the risks of being affected by a bad economy or disaster in one part of the world. Shell is a global company which has operations in over 80 countries, so it is very geographically diverse with about 40% of revenues coming from Europe, 30% from Africa and Asia and another 30% coming from North and South America. Operational diversity – The final piece of the diversity puzzle that can be important is operational diversity which can aid operational robustness. What I’m looking for here is a company that preferably has many customers, suppliers, products and services. What I don’t want is a company that relies on a single customer (like farmers selling to Tesco) or supplier (like a distributor who only distributes one company’s products), or a company that relies on one superhuman member of staff (like Berkshire Hathaway and Warren Buffett). Looking at Shell, none of these factors are obviously a problem. There are many millions of customers, many sources of fossil fuel supply and 90,000 members of staff, none of whom could be singled out as being critical to the company’s success. Another step on the road to safe investments is to invest in successful businesses. It sounds so obvious, but many investors forget it entirely when they unsuccessful businesses going ‘cheap’. Market leading – Most industries have a market leading group of three to six companies that dominate market share. In the oil and gas business there are six and they’re known as the ‘supermajors’ and they include BP, Chevron, ExxonMobil, Shell, Total and ConocoPhillips. Profitable – This is perhaps the definitive sign of a successful business, the fact that it makes money. To really be successful though this profitability needs to stretch back over many years. In my case I’m typically looking for 10 or more years of unbroken profits and, because dividends are a part of investor returns, I also look for a long history of unbroken dividend payments. Shell stands up to both of these tests. Stable – Although stability is not a requirement for successful businesses, it’s certainly makes the life of an investor much easier when trying to value a company. Companies that have stable historic sales, earnings and dividend payments are more likely to continue that stability in the future. This makes it easier to work out what sort of return an investor might get in the future. It’s also much less stressful to own stable businesses and a low-stress, low-risk approach to investing is important to many investors. You can see the results per share in the table below. Other than the spike in 2008, those results look relatively stable to me. Competitive advantage – Most companies that have lasted for more than a century and which are in the market leading group have some kind of competitive advantage. In Shells case it’s likely to be a mix of scale, brand and expertise, although I think most of their advantage is likely to be scale relative to any company that isn’t a supermajor. No matter how good a company is, if it carries a lot of debt then it’s risky. Good companies shouldn’t need a lot of debt to operate well, so this is one risk that should be easy to avoid. The total amount of interest bearing debt on the balance sheet is currently just under £24 billion, which is about 3.5 times the latest adjusted net profits of £6.7 billion. Generally I’m happy with anything where the total borrowings are less than five times earnings as this should be a manageable amount in the majority of cases. Change is inevitable. It’s also one more factor that complicates the lives of investors. It’s a favourite tactic of Warren Buffett to invest in companies that will be doing in 2050 what they were doing in 1950, or as he put it “I don’t think the internet is going to change the way people chew gum”. The past – Shell has been involved in the oil, gas and energy business since 1890 when the Royal Dutch Petroleum company was set up. Since then it hasn’t deviated significantly from that core business. The present – There aren’t any obvious signs that the company is about to move out of energy and chemicals any time soon. My assumption is that they will stay in this business for as long as it makes sense to. The future – It’s pretty clear that more people will want more energy in the future. From that point of view it’s likely that Shell has at least another 100 years ahead of it. However, those 100 years are likely to look very different from the last 100. With both peak oil and climate change looming, the next few decades should be a fascinating journey for anyone interested in energy production. However, although I do think that both peak oil and climate change will have a massive impact on energy production, I still think it’s likely that the existing supermajors will dominate for some time to come. That’s not too bad. A rise from about 1,800p to 2,240p which is about a 25% increase, plus there will be dividends on top. However, historic share price growth is not what I’m looking for, in fact typically the share price of attractive investments will have gone sideways or even downwards over the past five or ten years. What I’m interested in is earnings growth and you can see from the results table above that earnings have grown much more than 25% in the last decade. In fact they’re up by something like 80% in that time, which is around 6% a year. So while investors have seen the share price rise, the underlying company has in fact done much better than the share price alone would indicate. The reason for the poor share price performance is valuation. Over the last ten years the valuation multiple that investors have used to value Shell has fallen, and in the medium-term valuation is the most important factor in what returns investors get. 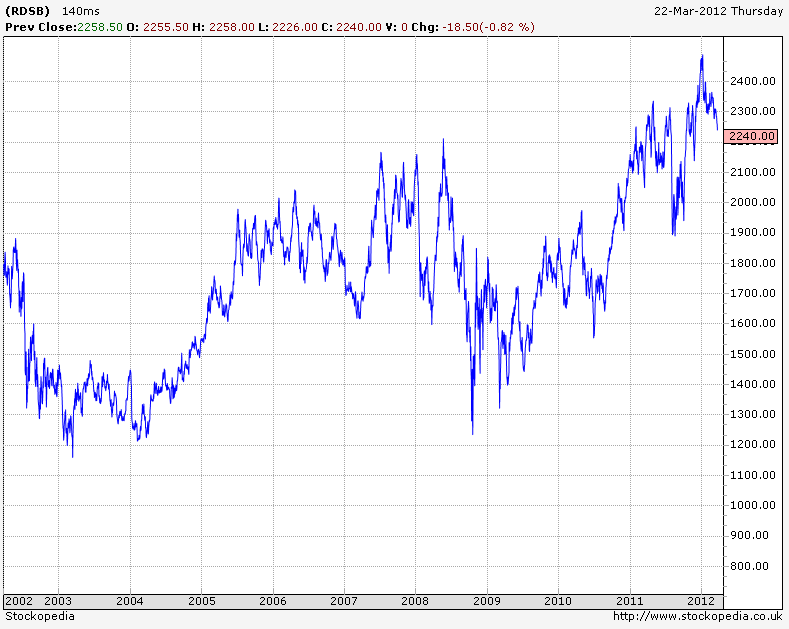 Valuation – Today Shell is valued at around 12 times its 10 year average earnings. Ben Graham often suggested a sensible limit of 20 times the average earnings, so it’s well below that. In fact this valuation is well below that of most large companies. The 200 companies that I track in detail have a median price some 18 times their average earnings. One of the most important reasons to look for low valuation companies is to avoid the fate of a falling valuation. Profitable businesses tend to have valuations that hover around some sensible level. At any point in time they might be valued too high or they might be valued too low, but eventually they reach a sensible price, if only for a short while. If you buy on the high side, as investors did to some extent with Shell in the past, then future returns are held back as the valuation reverts to its average. If, on the other hand, you can buy when valuations are low, there is less chance that they will fall further and at the same time there is more chance that they will go up, adding to returns rather than taking away from them. Buy low, sell high is a cliché for a very good reason. Dividend yield – Dividends are an important feature of investments for many reasons, but mostly because they are always positive and in the long-term contribute massively to total returns. At the moment Shell is yielding just under 5%, which is a very healthy cash income from such a long-lived FTSE 100 company. Just as important as the size of the dividend is its sustainability, and in this case there is no obvious reason why Shell should cut their dividend in the near future. In fact the company expects to raise the dividend again next year, much like it has for almost every one of the last 10 years. 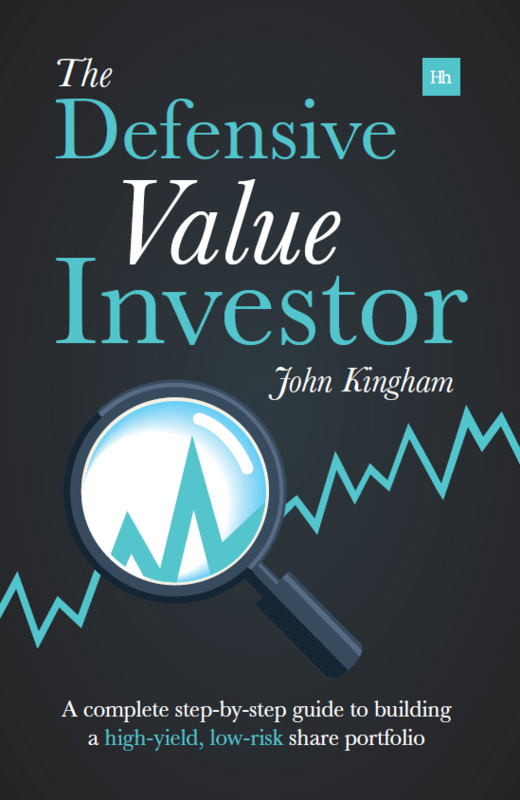 Are market beating returns a reasonable assumption? It’s easy to compare a company’s past and present results against the index that most investors are trying to beat. In the table below you can see Shell and the FTSE 100 go head to head in terms of 10 year annual earnings growth rate, price to 10 year average earnings ratio and current dividend yields. On each of the three drivers of equity returns, Shell has the advantage; the growth rate is a little higher, the valuation is slightly lower and the dividend is almost 50% higher. On the negative side I would say that Shell is a cyclical business and with oil prices still over $100 per barrel, times are good for now, but at some point the cycle will turn, high prices will have drawn in supply side investment and prices will drop. Or at least that’s the conventional thinking, but with Peak oil and China on the horizon I’d hate to try to guess the turning point. Instead I prefer to stay diversified and buy good businesses when they look cheap by long-term measures, and for now Shell definitely fits that description. AS a long-term holder of Royal Dutch Shell I fully endorse your assessment of the group’s long-term investment attractions. My only nagging concern is the recurring background noise about Shell’s involvement with oil spills in the Niger Delta, which accounts for about 10 per cent of the group’s oil output. Nigeria is not well covered by the international media and my worry is that one day we will wake up to a front page revelation in some well regarded newspaper, like the New York Times, showing that Shell’s pollution in the Niger delta is just as bad, if not worse, than BP’s recent horrendous problems in the Gulf of Mexico. Listening to the BBC Today programme last week, I was disturbed to hear Shell’s not very articulate front man in Nigeria put up a pretty unconvincing case for why the company has delayed handing out compensation to local people for pollution dating back several years. I would love to believe that Shell adheres to the same standards in terms of oils spills/safety in its operations in the Niger delta that it observes in the much more closely monitored North Sea or Gulf of Mexico. I would love to believe that Shell is a well managed company which operates in just the same way in the Niger delta that it does in the developed world. This is my only real concern about remaining a long-term shareholder. Hi Bill. Unfortunately this sort of uncertainty exists to some extent or other with almost all companies. If you look at BP, nobody really saw the Deepwater Horizon spill coming and it gave the company a hell of a kicking. The problems in Niger may or may not be real, they may or may not blow up, but either way, it’s incredibly difficult to factor those kind of things into an investment case, and it’s even harder to use them in a valuation. That’s why I try to emphasise other ways of staying safe, like diversification, avoid debt, looking for large, stable and profitable businesses and so on. Looking back at BP which I own, despite the magnitude of the Deepwater Horizon disaster, whether or not it will have impacted shareholders materially 10 years from now is very difficult to say. With the changes that the company is being forced to make, it may actually turn out to be beneficial to investors in the long run. It’s just so very difficult to tell in advance. 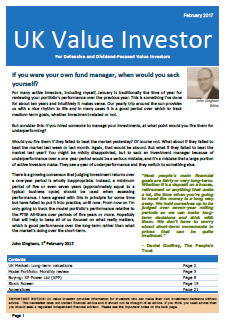 Hi John, interesting write-up – I hold Shell and am happy to continue to do so, so it’s reassuring to read your analysis. Where do you get your 10 year look at EPS and dividend? After getting most if the way through The Intelligent Investor I’m keen to look at more than the 5 years most sites/screeners seem to limit themselves to. Hi there Guy. I get the 10 year data from Sharelockholmes initially, and then the annual reports after that. There are a few other places that have 10 year data which I also use – Sharescope, Morningstar Premium, although both of those and Sharelockholmes cost money. It’s good to use more than one source as each data provider has different ways of calculating certain things like adjusted earnings for example. Even the results in annual reports often get adjusted in subsequent years, although usually only a little. The FT screener allows some selection on 10 year data but then reverts to 5 year data once you dig into an individual stock. That’s still a pretty good free compromise. And I forgot about http://www.stockopedia.co.uk, which is a new super-screener with lots of bells and whistles. They have 5 year data for now but are expecting to roll out 10 year data this year. I had a look at Sharelock Holmes the other day, after Richard Beddard mentioned it a couple of times on his blog, but wasn’t aware of the new stockopedia screener. A week or so ago I started retrospectively compiling data on my current holdings but gave up on the 10-year look after wasting an hour of my life trudging through Aviva’s annual reports! However, even using only a 5 year look for the rest, there’s an apparent correlation between those whose historic results made me grimace and those which are underperforming – a lesson learned, at least, without much damage. Although I treat any expense as a drag on performance, it’s seems like it’d be worth the relatively small cost for the time saving and the longer track record.